Public trust and confidence in the courts is integral to the credibility of the judicial branch. To be effective at managing in a way that promotes public trust and confidence, court leaders must be able to maintain an organizational culture that fosters integrity, transparency and accountability for all court processes and proceedings. The following learning objectives are designed for a comprehensive course. Faculty that are developing curriculum for basic or shorter courses may simplify or reduce the number of learning objectives. Describe the importance of public trust and confidence to the credibility of judicial branch. Compare and contrast historical writings and research to current discussions of public trust and confidence. Document the ways that transparent and consistent application of court procedures, as well as the timely resolution of cases, enhances public trust and confidence. Ascertain the level of public misperception about the courts and its causes, based on ten identified issues in Washington State. Identify the inherent connections between public trust and confidence and the principles of procedural fairness. Explore and discuss practical ways to implement the CCJ/COSCA proposed strategies for implementing public trust and confidence in each state and local court. Investigate and share participant experiences and challenges with implementing a systemic court management approach to public trust and confidence. 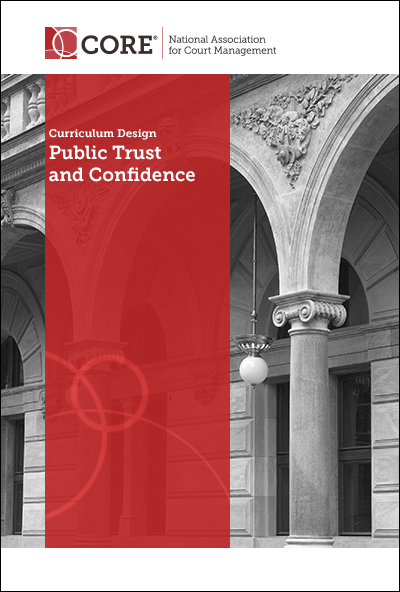 Demonstrate the ways that local courts assess public trust and confidence. Assess the level of public trust and confidence in your local jurisdiction. Connect national research on the role of the media related to the courts with the experiences of local courts and local media. Discuss and propose ideas and specific resources needed for community collaboration events to foster a greater understanding of the court process, services available, and methods for accessing them.